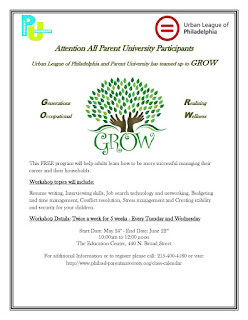 The School District of Philadelphia's Parent University has teamed up with the Urban League of Philadelphia to offer the Generations Realizing Occupational Wellness (GROW) program. This FREE program will help adults learn how to be more successful managing their career and their households. The workshop topics include: Resume writing, Interviewing skills, Job search technology and networking, Budgeting and time management, Conflict resolution, Stress management and Creating stability and security for your children. This FREE program will help adults learn how to be more successful managing their career and their households. Resume writing, Interviewing skills, Job search technology and networking, Budgeting and time management, Conflict resolution, Stress management and Creating stability and security for your children.